News out of the United Kingdom is that another automated breast ultrasound (ABUS) system has just been announced. Funded by Innovate UK the project is a collaborative effort between the National Physical Laboratory (NPL), University Hospitals Bristol and Precision Acoustics Ltd. The National Health Service (NHS) currently runs a breast cancer screening programme using mammography and, should a suspicious lesion be detected, the woman is sent for a another clinical examination involving further X-rays and conventional hand-held ultrasound. The NPL has patented a novel method that employs pyroelectric sensors to convert ultrasonic energy into heat, generating electrical signals that are subsequently converted into an image. 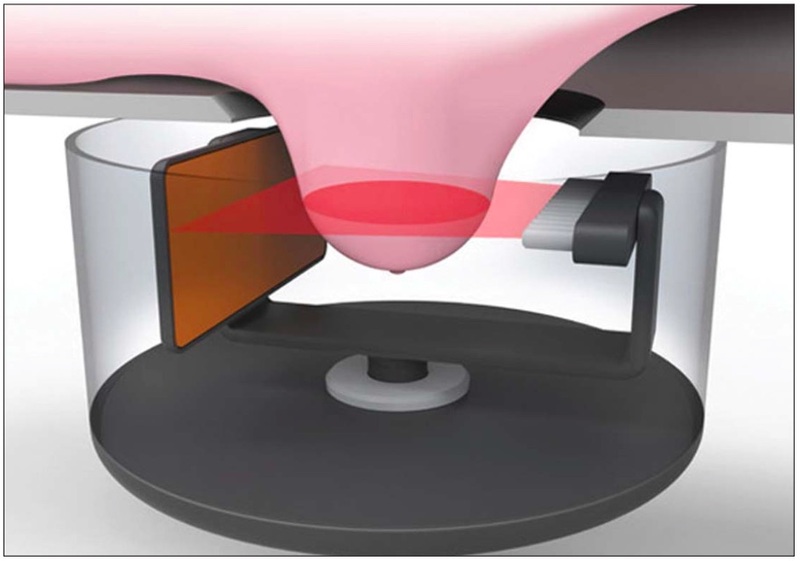 It is claimed: “these large-area thermal sensors should generate far fewer image artefacts than conventional piezoelectric detectors, which are sensitive to the phase of the arriving ultrasound waves.” In their proposed configuration, the patient’s breast will be located in a bath of warm water between the ultrasound transmitter and receiver (see image above right). The whole assembly can then be rotated around the breast, enabling a 3D image of the underlying tissues to be reconstructed. They have a long way to go, especially when compared to Delphinus Medical Technologies from the USA, a company whose story we featured in a January 2014 story. At that time Delphinus had just received FDA approval for their ABUS system that has a similar design to that seen above. Last month Beringea, a private equity firm announced that it had joined other venture capital firms in a Series C funding round, investing $39.5 million in Delphinus. These funds will allow the company to recruit a world-class management team, to complete a pivotal multi-centre premarket approval trial and to bring their SoftVue technology to market. In the mean time, the British team is still looking for commercial partners to translate their UCT technology into a clinical device, while the clinicians in Bristol remain suitably skeptical.